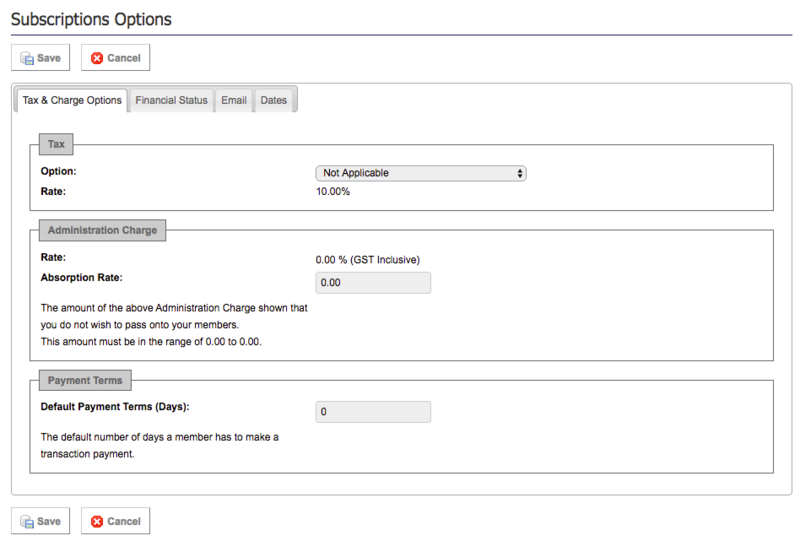 The second step of setting up your membership is configuring your Subscription settings. Your Tax Rate (GST, VAT, etc) will be set up and determined based upon the country that your organisation is based in, but you then can determine whether this tax is applicable to your organisation within the Management Console. This will then be reflected in the receipts received by your members and what they are charged on the Members Portal. STG do not deduct the GST amount from the settlement that your organisation will receive. If GST is set to 'Applicable' it will display the relevant GST component of the money the club has received. If this setting is switched to 'Not Applicable,' the GST column will not display in the settlement report. The money received by the club or centre remains the same. Your organisation has the option to absorb the STG transaction fee or pass this along to your members. This will be automatically set up in most cases to absorb the fee, but you can make changes to this at any time. The absorption rate can then be set from any amount from 0% up to the amount of your organisation's charge rate. Please note that in not absorbing the transaction fee, the administration charge will display on all transactions (manual and online). When processing transactions in the backend that will be paid via a manual payment method this total amount will need to be manually updated to remove that fee. Automatic Email Reminders will send a reminder email to members who have an Unpaid Transaction that is overdue. This determines the number of days an Unpaid Transaction can remain overdue before a reminder email is sent. This sends an email notification to a member when an Unpaid Transaction is generated in their account, by an administrator. This sends a copy of the Receipt to a member upon the processing of a manual payment. This will also send a notification to a member if their payment is unsuccessful in the case of installments. This sends a notification to the member that a transaction in their account has been cancelled by an administrator. You can turn these emails off at any time by going back into Options and clicking No.